Ryan Federer is an Associate in the Litigation & Alternative Dispute Resolution and Real Estate Litigation Practice Groups. His practice focuses on commercial foreclosures, loan workouts, creditor’s rights cases, and the adjudication of rights under commercial leases. Mr. Federer represents lenders, financial institutions, owners, and lessees through all aspects of a dispute from inception through redemption, sale, trial, or other disposition. 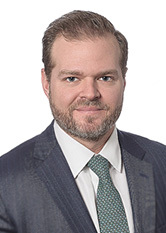 Mr. Federer also has extensive experience representing individuals, businesses, government entities and not-for-profit organizations in all manner of complex commercial litigations, including business disputes, breach of contract claims, employment actions, and professional liability matters. Mr. Federer has litigated cases in New York state courts, New Jersey state courts and the USDC, District of New Jersey as well as proceeded to mediation and arbitration on numerous matters. Mr. Federer is a member of the Essex County, New Jersey, and New York State Bar Associations.